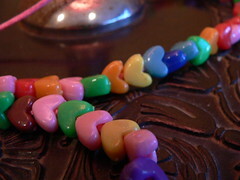 Over a period of two days JJ made me this necklace at after school care. Perhaps he’d seen me make my necklace and didn’t want to be outdone so he started his? I don’t know. He gave it to me and I effusively thanked him because I know he’d gone to great effort and used up a lot of patience which he doesn’t really have. And it is made up of lovehearts so it’s really special. Trouble is, that it’s been taken away from me a few times because I’ve been mean. I’ve given him consequences for behaviour that I won’t tolerate from him so his answer is to take the necklace away. I’ve explained that once you give a present to someone you shouldn’t take it away from them but I don’t think that’s sunk in yet. The thing is, when I’m good again, I get the necklace back again. I currently have the necklace so I must be being good. « Learning to read while sleeping? That’s funny, I guess there are things you take for granted that kids don’t know, but it’s a sweet gift. JJ’s necklace it beautiful Jen. I guess he’s counting on you loving it so much that you’ll think twice about being bad so he has to take it away. And of course, I love what he considers “bad.” What a great little guy.